Computer engraving uses a computer to determine where the diamond tipped scratch/rotary head is supposed to remove material from an object. The engraving for computer engraving will expose the color of the metal. For example, on a blue anodized aluminum plate the engraving will appear as silver (color of aluminum). Computer engraving is the oldest technology that we use to perform engraving. We’ve been progressive in putting our resources into newer engraving technology such as sublimation and laser engraving. Thus our ability to perform computer engraving is very limited. We can only engrave up to 10 fonts and we can’t engrave graphics. We prefer to not engrave plates larger than 5” x 8” due to the size of our engraver. Great care has to be taken when handling freshly engraved plate because the metal extracted during the engraving process is on top of the plate and may scratch the surface of the plate if it is wiped away. Generally excess material is removed with the assistance of an air source. Computer engraving is used a great deal with perpetual plates. However the problem with perpetual plates is that the accuracy of the machine is up to the thousandths position (0.001”) and the table that the plate is mounted to engrave is only accurate up to (0.25”). So it is near impossible to consistently line up the next line of engraving on perpetual plates. Computer engraving is labor intensive and hard on the equipment. If you can't find your designed products, please check our supply warehouse at . Please indelicate product number or image when you email us. Laser (CO2) engraving is highly versatile and is only limited by the imagination of the operator and the client of the end product. 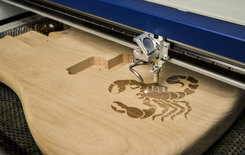 Laser Engraving can be very expensive due to the amount of production time that it takes to produce the product. Laser engraving production time can be less than 1 minute to as long as 20 minutes and this all depends on the size of the piece, art, amount of text, font and font size. Laser engraving is designed to remove material by burning it away. On acrylics the engraving will appear to be white unless a fill (such as gold or black) is applied. On wood the engraving will appear to be a tone darker than the natural wood color unless a fill (such as gold or black) is applied. On painted metals the engraving will appear to be the same color as base metal (Gold for brass & Silver for Aluminum) after the painted surface is burned off. On wood & metal we will burn the front of the piece and for acrylics we usually invert the image and burn the back so your front surface on acrylics is flat. Our laser engravers are capable of engraving into wood, plastic (microsurfaced), acrylics, resins, marble, anodized aluminum, painted brass, cork, corian / avonite / fountainhead, derlin, leather, mat board, melamine, glass/crystal, and much more. We have the ability to engrave flat objects and round objects with our rotary attachment. Aside from engraving the products that we sell we’ve engraved for our customer their personal objects that include wine glasses (wedding), glass mugs (Corp. Event), Baseball Bats & Glove (Personalization), Cue Stick, Shovel Handles, Rifle Stocks, Axe Handles, custom plastic signage, etc. The only requirement is that the laser must be within 2” of the laser head while it is being engraved. Round products if they are be engraved around the object must not be longer than 16 inches. The best approach to determining if we can engrave your personal object is to bring in a sample for use to try to engrave. We can laser engrave text from our vast collection of fonts to graphic from our art library to custom art and logo. Sublimation engraving as our standard engraving and in most cases the engraving is included with the cost of the item. Sublimation is the most efficient and cost effective engraving method that we offer. Your engraved plate can be produced in as little as 30 seconds. Sublimation engraving isn't actually engraving because instead of extracting material we are actually permeating the polyester finish of the metal. Your engraving is printed, pressed on a metal plate, and then attached to your award. During the pressing the heat and pressure from our 350° F heat press allows for the sublimation to transfer through the polyester coating of the metal and onto your plate. Sublimation is available in full color (presently we do not offer this service) or in single colors. Our standard sublimation engraving is black. Sublimation looks best on a light colored metal such as our stock gold and silver anodized aluminum. We can sublimate text from our vast collection of fonts to graphics from our art library to custom art and logos.